When you give a small child a stuffed animal there is an innocent excitement that lights up spirits and transforms dispositions. This is one of the simplest acts of kindness that unites the world of children together. Back in the U.S., I kept being reminded of a small group of children and the simple joy they exuded when gifted with a little stuffed lion or lamb. Knowing first-hand the needs of tens of thousands of displaced children living in tents in Iraq, Turkey, Kurdistan, and Syria, we wanted to do something more. We wanted to offer these children something that would bring comfort and peace to their little troubled hearts and minds. We wanted to reach children and let them know just how much God loves them and cares deeply for them. As we learned about the culture these children live in, we recognized trying to spread the Gospel outright would be offensive, if gotten into the wrong hands. The last thing we wanted to do was close the door that God had opened for us in Iraq and the bordering countries. We had the thought of putting calming music along with prayers in their language inside these little stuffed lions and lambs. We realized that each child living in these tents would be sharing the peace and message of God’s love for the entire family to hear. The Arabic music was created to produce a calming effect in each child’s heart and to assist them in their trauma recovery. We had an American woman, with a Ph.D. in music and residing in Turkey, oversee the production of creating the trauma-reducing audio content, in both Kurdish and Arabic. Our ministry chaplain, Chaz, chose the prayers and passages from the Bible specifically to bring hope, peace, and God’s unfailing love to each child’s heart. The selected scriptures have no references directly to Jesus in an effort to avoid offense, danger or being challenged by people of other faiths. After much research and finding the right manufacturing company, plus 12 months of telling folks how they can help us put one of these into the hands of the children, our new team went back to Northern Iraq and hand-delivered 11,000 Lions and Lambs. Such beautiful faces and smiles made it worth it all. Our only regret with that trip was that we didn’t have enough for all the children in the camps. As I write this, our family just got back from spending the summer in Northern Iraq where we delivered another 10,000 Lions and Lambs. Our teams are still there handing out thousands more. In addition to these Lion and Lamb comfort stuffed animals, we packaged the huggable hope in a multi-purpose backpack, along with a comic book of Victor’s testimony story, and a ‘boo-boo’ band aid kit to help with cuts and scrapes. 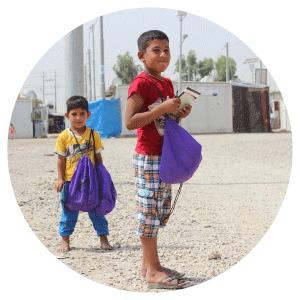 We are so excited to continue our work in Iraq and to distribute more Lion and Lamb Life Packs to the children of this war-torn region. Will you join us in our efforts to reach children in the darkest places with God’s love? 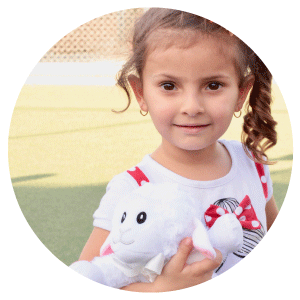 For $30 you can sponsor one child’s Lion and The Lamb Life Pack. Sponsor a child and help us at ReachChildren today!